As I entered the College I met a real live WWII veteran. His name was Kenneth Jewson who served in the navy protecting our Pacific coastline against invasion. He was only 17 years old at the time , and is now a spry 88 years old. Kenneth is a member of the Onandaga Tribe and was accompanied by his grand-daughter. As I strolled the community college auditorium I met many Native American’s who served in the armed forces. There are some very fascinating stories among these brave men and women. Many of my fellow brothers served in the marines, with Salamander Bearwalker having a story that deserves to be made into a movie. Five tours of duty in Viet Nam (as a sniper) has “Hollywood written all over it. Bearwalker and his wife Nacombius had their 7-year-old grand-daughter with them. Ayita was going to help lead the dancing with her grandma and grandpa, as they do every year. Sitting at a table right beside them was Wayne Hardwick who is the All Nations Veterans Council Leader. Wayne served in the U.S. Marine Corps from 1974-77, and is from the Chippewa tribe. I have a picture of Wayne holding the “Eagle Staff” with the actual head of a golden eagle on the top. Eagle feathers run down the side as it honors those who have served this nation and those who have honored the Native American heritage. Tom and Margaret Osborne had their “Northern Trading ” table set up with every fur-bearing animal in North America. Tom is quite a character as he has been a trapper, hunting guide, and world champion predator caller among his list of so-called jobs! I bought a racoon fur from him, as I needed one for my collection. Tom says he has actually called coyotes into his “lap” and he has the scars to prove it. Tom is also a Viet Nam veteran serving in 1966-67. Same years I served! As I was looking around I came across Jack Hickey Jr. He was just setting up his display, but was gracious enough to talk with me awhile. He makes Native American Jewelry, and I must say his craftmanship is superb. I bought a beaded bracelet from him. Jack was representing the Osage Tribe. Randal Estrada was the next guy I had the pleasure of meeting. He goes to many of the Pow-Wow and makes authentic Indian Jewelry. Randal was just setting up his display, but what I saw was very impressive. Randal was representing the Santo Domingo Pueblo tribes from New Mexico. I had noticed a women getting her grand-daughters regalia outfit ready, and once she was all set, I took her picture. Lilah (Thunder-Spirit) is from the Eastern Band of Cherokee. She was so proud of her outfit and I think grandma and grandpa were proud of her. I have more I can write, but will save it for another day. Most recently, three American crows in Ingham County tested positive for West Nile virus – the state’s first report this year of the virus. West Nile virus is carried by birds, and has been known to be transmitted from bird to bird only by mosquitoes. Mosquitoes become infected when they feed on a bird carrying the virus. The infected mosquito then transmits the virus to another bird through a second bite. Most birds are relatively resistant to West Nile virus, and serve (as carriers) to maintain the virus in the avian population. Susceptible bird species (crows, ravens, blue jays, hawks or owls) and mammals may be infected with West Nile virus when bitten by a “bridge vector” mosquito (one that feeds on both birds and mammals), which transmits the virus outside of the bird-to-bird cycle. Bridge vector mosquitoes then may transmit the virus to a horse, human or other mammal. So far in 2015, there have been no confirmed cases of humans being infected with West Nile virus. The corvid family includes species – American crow, common raven and blue jay – most sensitive to West Nile virus. Several of the raptor (hawk and owl) species also can be adversely affected. Birds showing neurological signs consistent with West Nile virus may demonstrate an inability to perch, walk or fly, and often are in poor physical condition and dehydrated. To report birds suspected of being infected with West Nile virus, call the DNR Wildlife Disease Lab at 517-336-5030. For more information, including precautions to protect against the virus, visit the West Nile virus section on Michigan’s emerging diseases website. Yesterday morning was the perfect weather to do some fishing with the grandkids. I picked two of them up and met the other two at the lake. Three grand-daughters and one grand-son. I had picked up some worms before arriving and had a couple of brand new spin casting reels for 2 of the girls. No more “Snoopy” or “Barbie” poles for these girls. McKenzie had never caught a fish before so she was first to get her line set up. The worm had hardly hit the water when the bobber went under. McKenzie started walking backward rather than reel the fish in, but she got the job done by landing a hefty blue gill. Addy was next and it didn’t take her long to haul in a nice sun-fish herself. About that time Ava wants a pole set up for her, and Keegan was waiting patiently for me to set him up. Wow! I didn’t have enough hands, as the fish were biting fast and furious! Ava is 11 years old and she was doing everything (except put the worm on) herself. She was casting and catching one panfish after another. I was waiting for someone to catch a small sunfish so I could use it for bass bait for Keegan. We were finally able to set up two poles with smaller fish and a bobber. “Bam!” “Bam!” The hungry bass hit both lines simultaneously, and Keegan and I had our hands full. I landed a 3 pounder first, and Keegan landed its twin brother seconds later. That was his first largemouth and he was super excited. We went on the catch 8 very nice bass with Ava landing one all by herself with her small hook and dangling worm. What a great morning we had reeling in fish after fish. We only kept a few of the fish that were not going to “make it.” The rest we released back into the lake. The girls had several “first” when it comes to fishing, along with Keegan’s “first bass.” during the morning both Keegan and myself had a large bass on that broke our lines. It takes a large bass to snap 8 pound test line. Ava is hooked, as she is now my fishing buddy. The two younger girls lost interest after catching several fish, and were more interested in playing Barbie. That’s ok as this “Grandpa” had a great time with his grandkids at the lake! The Michigan Department of Natural Resources reports that black bears are heading south in their quest for food and territory. Wildlife outreach technician Jordyn Richardson told the Grand Rapids Press that black bears are becoming more prevalent in the swampy area around Cadillac. It was also reported that a bear killed a beagle near Cadillac last Monday evening. There was also another bear that was struck and killed by a motorist south of White Cloud just hours before the beagle was attacked. It has also been reported that bears have been seen further south near South Haven and Hartford. The vast majority of Michigan black bears are found in the Upper Peninsula, but the numbers seem to be on the increase in the lower. Katie Keen, another wildlife tech., says people are more likely to see more bears at this time of year because mothers and new cubs are looking for food. I suspect that mother bears also want to keep cubs away from dominate male bears, who will kill the cubs if given a chance. The male bears do this in order to bring the female bear back into “heat” so he has the chance to mate with her. In each area where there is a population of bears there will be one dominate male bear. Once bears reach sexual maturity the dominate boar will not tolerate competition from his fellow male “want to be’s!” He is more than willing to fight for the rights to breed in his domain, and other males will have to look elsewhere for “love!” This then brings about another way that the bear is ever-expanding its presence. After all the rain we have been getting my back yard looks like a jungle. Today I tried to cut the lawn with my ride on lawnmower. I saw three toads and a “snake in the grass” as I chopped down their hiding places. I caught the snake and identified it as a harmless garder snake. Wish my grand-daughters would of been hear so I could chase them around the yard a little. Below is a great publication by the Michigan Department of Natural resources concerning Michigans snakes. It’s very informative and worth the read. 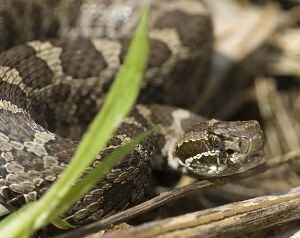 This time of year, as snakes are out and about in the great outdoors, the Department of Natural Resources gets many questions about Michigan’s snakes. Michigan is home to 18 different species of snakes, 17 of which are harmless to humans. There are two that are very similar and often cause a stir when people encounter them. Eastern hognose snakes, when threatened, puff up with air, flatten their necks and bodies, and hiss loudly. (This has led to local names like “puff adder” or “hissing viper.”) If this act is unsuccessful in deterring predators, the snakes will writhe about, excrete a foul-smelling musk and then turn over with mouth agape and lie still, as though dead. Despite this intimidating behavior, hog-nosed snakes are harmless to humans. The eastern massasauga rattlesnake, the only venomous snake species found in Michigan, is quite rare and protected as a species of special concern due to declining populations from habitat loss. As the name implies, the massasauga rattlesnake does have a segmented rattle on its tail. It should not be confused with the other harmless species of snake in Michigan that do not have segmented rattles but also will buzz their tails if approached or handled. Eastern massasauga rattlesnakes are shy creatures that avoid humans whenever possible. Also known as “swamp rattlers,” they spend the vast majority of their time in year-round wetlands hunting their primary prey, mice. When encountered, if the snake doesn’t feel threatened, it will let people pass without revealing its location. If humans do get too close, a rattlesnake will generally warn of its presence by rattling its tail while people are still several feet away. If given room, the snake will slither away into nearby brush. Rattlesnake bites, while extremely rare in Michigan (fewer than one per year), can and do occur. Anyone who is bitten should seek medical attention immediately. To learn more about the massasauga and for more snake safety tips, visit http://mnfi.anr.msu.edu/emr/index.cfm. Those who encounter a snake of any kind should leave it alone and should not try to handle or harass the snake – this is primarily how snake bites happen. A snake can only strike roughly one-third of its body length, so it is physically impossible for people to get bitten if they do not get within 24 inches of the snake’s head. Michigan snakes do not attack, chase or lunge at people or seek out human contact. Simply put, if left alone, Michigan snakes will leave people alone. Also, be sure to check out the DNR’s 60-Second Snakes video series for identification tips and information about Michigan’s snake species. The DNR asks Michigan residents to consider reporting any reptile or amphibian sightings to the Michigan Herp Atlas research project to help monitor amphibian and reptile populations in Michigan and protect these valuable resources for future generations. Visit www.miherpatlas.org to learn more. Pastor Saeed Abedini (A U.S. Citizen) Held Prisioner For Almost Three Years In Iran! Over 938,000 have signed a petition for Pastor Saeed’s freedom. Help us reach 1 million voices for Pastor Saeed. Be his voice. Add your voice (below and) atBeHeardProject.com. Michigans Spring turkey season ended a couple weeks ago and I’m just now gathering information on how the Ansel clan’s hunting went. I was quite surprised to get the “low down” from my brother Darryl, as he sent me picture after picture from his memorable year. Darryl started his season off by dropping a huge Tom not far from home, and then went on a “turkey calling” rampage in getting birds within range for 4 of his grandsons, his son, and his brother Brett. It was the first bird for Grandson Jackson and believe it or not the first bird for Brett. Successful hunters were Tanner, Tristan, Jackson, and Caleb (grandsons) Derek (son) and brother Brett, and of course the old turkey slayer himself Darryl. That’s 7 birds from just one family and you throw mine in the mix and it’s eight. That is by far the most successful year we have ever had, and it shows just how well the DNR has done with their efforts to expand turkey range and management in Michigan. I am going to post the pictures of the smiling hunters and their Thanksgiving turkey dinners. Congratulation to all. It’s great to see these kids and young men getting involved in the great outdoors here in Michigans woods and waters. Darryl I want you to guide me next year. 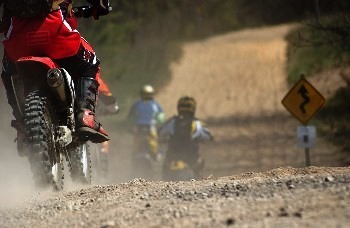 The Michigan Department of Natural Resources invites off-road enthusiasts to enjoy two Free ORV Weekends this year onJune 13-14 and Aug. 22-23. During these weekends, the DNR waives the requirement to have an ORV license or trail permit to ride an ORV on DNR-designated routes and trails, and on public roads open to ORV riding. ORV riders can explore more than 3,700 miles of designated ORV trails. All rules found in the2015 ORV Handbook of Michigan Off-Road Vehicle Laws apply during Free ORV Weekends. ORV trail maps are available atwww.michigan.gov/orvtrails. ORV riders are invited to share photos and updates about their Free ORV Weekend experiences on social media using the hashtag #MiFreeORV. For more information about the upcoming Free ORV Weekends, contact Maia Turek atturekm@michigan.gov or 989-225-8573. A Recreation Passport grants vehicle access to any Michigan state park, boat launch, state forest campground or nonmotorized state trailhead parking. Residents can purchase the Passport for just $11 ($5 for motorcycles) at the time of Michigan license plate renewal through Secretary of State. Forgot to check “YES” during renewal? Residents and nonresidents can purchase a Recreation Passport window sticker during regular business hours at state parks. Learn more about how the Recreation Passport supports state parks and local outdoor recreation opportunities atwww.michigan.gov/recreationpassport. The One That Got Away and The One That Didn’t! As my friends and family all know, I do not have a cell phone. I may be the only one on the planet that cannot communicate from “tower” to “tower.” I used to have one, but two summers ago I jumped into the pool, cellphone in my pocket. Probably many of you have done that, so you may know where I’m coming from when I tell you that was my fourth time that I drownded my phone. That’s when my wife put her foot down and said we both would now be using her $10.00 dollar phone. You can’t even text with it! Anyway yesterday I’m fishing a small lake from shore and I’m catching one big bluegill/sunfish after another. I had another pole so I put a worm harness on and gave it a heave. “Bam” a nice largemouth takes my offering. I get it landed and put it on the stringer with 15 large panfish. Mind you my intention is not to keep the fish, but I would like a good picture of them before I release them. I go to my car to get the camera and the bass has pulled the stringer out of the sand and headed for deep water. Without thinking or hesitating I wade in after my stringer. It’s in 4-1/2 foot of water and I have to go “under” to get my hands on the cord. I come up totally soaked and the big bass has made an early “release!” As I’m walking back to shore I remember my wallet is in my pocket and that (Heaven Forbid) I had borrowed my wifes cell phone! I almost have a heart attack as I rummage through my pockets for all the important stuff I never thought about in my bid to save my $3.00 dollar stringer! Well I caught 4 more bass and around 40 panfish which I released as soon as I unhooked them. I did get a picture of one of the other bass and panfish, but not the big one that got away. Actually I came awful close to having 2 “big ones” get away. The bass was going back in the water anyway, but thank God the cell phone didn’t escape with it. That’s my story and I’m sticking to it. Michigan Department of Natural Resources Director Keith Creagh today applauded a publisheddecision from the Michigan Court of Appeals that upholds a 2011 Invasive Species Order issued by the department prohibiting Russian boar in Michigan. The Court of Appeals ruling overturns a March 2014 decision from the Marquette County Circuit Court. The 3-0 Appeals Court decision holds that the Invasive Species Order “meets constitutional standards in all respects” and remains in effect in Michigan. In Michigan almost all feral swine – that is, swine outside of captivity – are Russian boar. Russian boar are not native to Michigan. All Russian boar in the wild were either introduced intentionally into the wild or escaped from captivity. The Invasive Species Order that declared Russian boar illegal in Michigan was prompted by concerns that feral swine are significant disease carriers that can jeopardize domestic livestock and threaten wildlife and even humans, and that feral swine cause ecological and agricultural damage, ranging from rooting up farm fields and damaging crops to wallowing in rivers and destroying aquatic habitat. The order was designed to prevent additional Russian boar from becoming feral. Pictured above is a small feral hog I shot here in Monroe county several years ago. These animals are an “invasive species” and hunters need to help rid our state of them before we become another Texas. The population in Texas runs in the millions, and it seems it is almost impossible to eradicate them. Sure hope that doesn’t happen here.